Considering that in 2050 today’s population will live in cities and only 30% of people will live in rural areas, one of the big questions is food. Who is going to provide crucial crops, vegetables, meat and/or other items such as dried insects or tofu? There is a big need for innovative food solutions, of which you will get to know some in this article. Experts say that apart from agricultural production, urban production of aliments will become increasingly important. To cater for the needs of a growing population, an additional fertile ground the size of Brazil will be necessary, which is not available. But the roofs, empty factories and other spaces in city offer a possibility to grow foodstuff, which is already used to day by many urban citizens to grow the likes of herbs, tomatoes or potatoes. In this article, I will look at various urban farming practices such as vertical farming, aquaponics and small-scale solutions from the Global South. I will also briefly discuss the participatory implications of urban farming. So far, urban gardening is mostly for private use and does not suffice to contribute to the steadily growing demand of cities worldwide, but especially on the African and Asian continent. More complex systems than private urban gardening are necessary. That is why interest is turning towards vertical farming, which has been pioneered in Singapore since the opening of the first commercial vertical farm in 2012. In the middle of the city, farmers use stacked rather than horizontal production. In shelves, racks and on several floors, food like fruit, vegetables, wheat and fish are grown. LED lamps create bright lighting which allows lettuce to grow to full size within 15 rather than 30 days, for example. Estimates say that a 30-floor-farm could produce enough food for 50,000 persons. However, current vertical farms are only a few floors high. 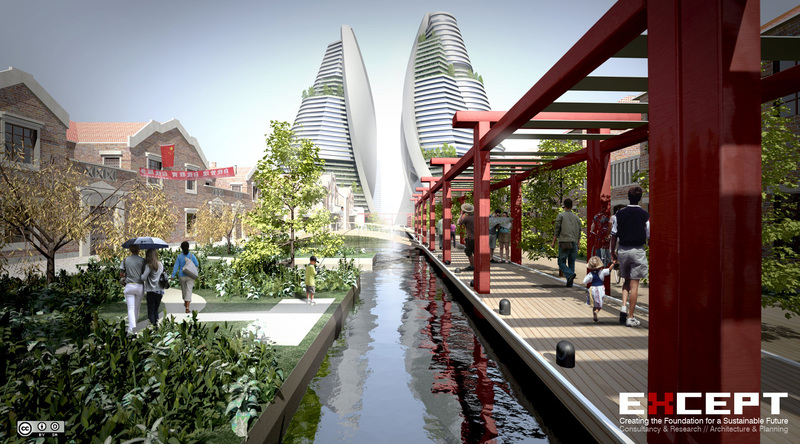 Visualisation from the Shanghai Sustainable Masterplan with food gardens to the left and vertical farms in the distance. One of the biggest advantages of vertical farming is the quick, efficient and space-saving production design of many different aliments. They have a low need for resources, since plants are being nourished by rain water mixed with minerals, but without fertilisers. Transportation routes to the customer are short. Production, refining and delivery create new jobs in cities. There are plans for these modern urban farms to cover their own energy needs through wind turbines or solar cells on the roof. So far, the high energy costs for LEDs are a big hurdle for urban farms. To start one of these farms, farmers need a high seed capital and a lot of courage to innovate. 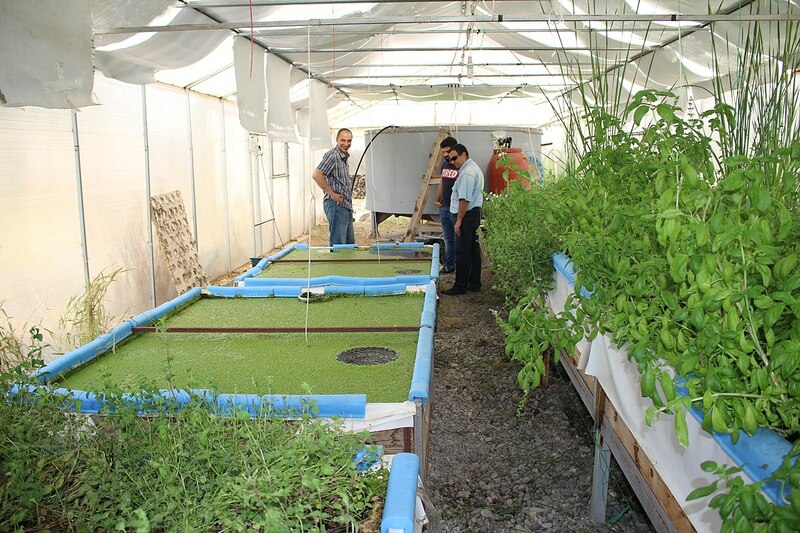 What can aquaponics contribute to a more sustainable food production? This system with its circular production is as sustainable as it gets. The idea is to produce resource-efficient, high-quality food in cities. Aquaponics combine aquaculture to produce fish and hydroponics, a water-free system for growing vegetables, herbs and fruit. Together, they result in aquaponics. These systems are easy to install, shorten transport routes and cooling chains and contribute to protecting the environment. How does the ideal aquaponics farm work? Here, we have to circles that feed into each other. We cultivate seebass in special containers. The “dirty” water can be used to water the plants, since it contains nutrients from the fish excrements. The plants also filter the water, so it can go back to the fish tanks. At the same time, we need to heat the fish tanks with solar energy. The warmth helps the plants, which are in an adjacent greenhouse, grow. Ideally, the unused biomass from the plants would go to chicken, whose excrements can be used to grow larvae, which are again food for the fish. However, it is difficult to have three circles. What are the challenges for aquaponics? They are expensive to install and to keep running. Also, a circular system poses a high risk. I don’t think that there will be many aquaponics farms in city centres soon. However, they can be an addition to farms outside of cities. Currently, there is not yet enough political interest in urban food production through vertical farming or aquaponics to really go big-scale. However, some industrial countries like the United States, Japan, Singapore, South Corea and Germany have a growing number of Vertical Farms. Since these countries do not have population growths or urban growth comparable to countries of the Global South, it will make more sense to establish vertical farms in countries like Nigeria, Ethiopia, India or Bangladesh. In Kibera, the largest informal settlement of Kenya with up to a million inhabitants, women have a slightly different version of vertical farming. Since there are no multi-floor buildings or empty spaces available, they grow vegetables in tall bags filled with earth. Holes at different heights allow a levelled production even in a very small space such as a backyard. At the same time, the women grow enough to sell some of their produce. China has the quickest urban growth rate in the world. A team of Spanish architects developed a food farm for rice and vegetables in the Tai Po District. Products are growing in a network of several, 200-metre-high towers. Their floors can be moved according to the sunlight. This kind of fabric can probably produce enough food for the whole district of 300,000 inhabitants. For some more interested examples of the Shanghai masterplan for food, see here. Panama has Latin America’s first and only urban farm project called “Urban Farms” (founded in 2014). 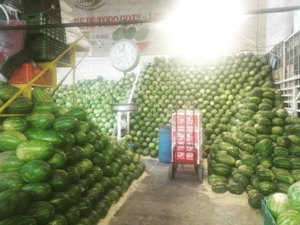 On two floors of 30,000 m² each, many different products such as strawberries, melons, eggplants, tomatoes etc. grow next to each other, but also on top of each other and up the walls. Instead of providing the people living nearby, the farmers decided to export large parts of their harvest. How does participation play into all of that? I think that urban gardening projects are very important in order to grow consciousness and create spaces in cities. These gardens have many advantages, which also include the sense of community and responsibility they foster. Building on that, more people might become interested in doing urban farm work, be it in a vertical farm or another model which is suitable to their city. The concept of the Edible City is also important in terms of awareness and education. At the same time, agricultural production will remain the main source of food for many cities. Therefore, it is important to support farmers and buy locally. While urban farming can contribute to production and is not as susceptible to catastrophes and parasites, it cannot in the near future provide enough foodstuff for “exploding” cities. There is much need for more experimentation with vertical farming, aquaponic farms and similar concepts. 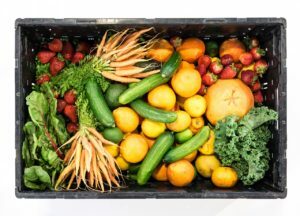 A seasonal vegetable box, the perfect example for Community Supported Agriculture. Community Supported Agriculture can be a good solution, securing the local production of food and supporting neighbours. By buying a vegetable box and consuming at farmer’s market or other weekly markets, you are already contributing to this model. Ideally, food security will be given all around the globe in the near future by trusting a complex farming system adapted to each city. The elements of this system should be vertical farming, aquaponic farms, urban gardening, a ring of farms around each city and innovative ideas coming from the population. Apart from food security, this would also guarantee the high quality of organic, sustainable and cruelty-free nutrition. Did you like this article? Please share your thoughts and ideas in the comment section below and don’t hesitate to contact me (laura@parcitypatory.org).